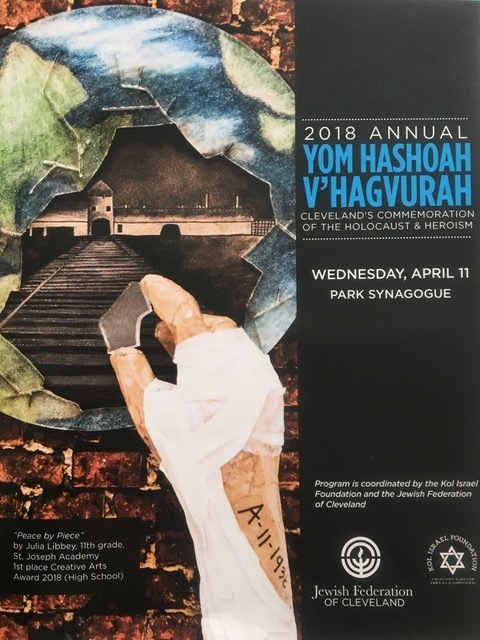 Yom Hashoah is a day devoted to the remembrance of the Holocaust. On a day chosen to coincide with the Warsaw Ghetto uprising, cities around the world honor the victims as well as the heroic. James A. Garfield High School students are always encouraged to enter the creative writing contest following a unit featuring Holocaust literature. Over the past 15 years, a Garfield student has always placed somewhere in the contest, but this year they really stood out, placing first, second, and third place in the creative writing category. Sophomore Jesse Marderwald, placed third with his poem, “Sand in the Glass.” Junior Chad Angermeier placed second with his poem, “Sands and Ashes.” Junior Caillean Galayde, took first place with her poem, “In the Darkness.” In addition to having their poems published, each was awarded a cash prize. Caillean Galayde was also honored with the invitation to recite her poem at the commemoration. This year’s success is rewarding considering the number of schools that participate, but it is especially meaningful to see our students approach difficult themes and subjects with maturity and sensitivity. In fact, James A. Garfield has become quite well known to the survivor community in Cleveland, and the high school has even had visitors pop in to see what makes our students stand out.